Daniel House takes a look at a position group that riddled the Vikings defense last season. Can Erin Henderson be a legitimate option at middle linebacker? 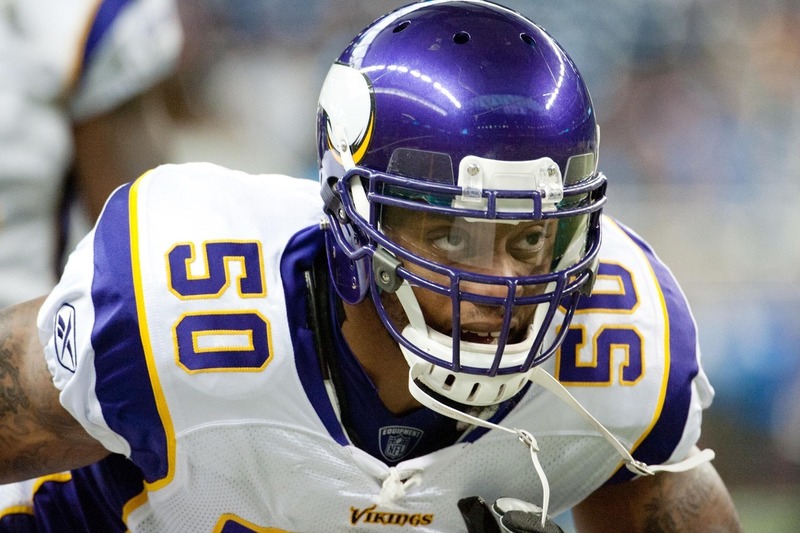 Many including myself, have questioned the Vikings stance when it comes to the middle linebacker position. Are we adequately or sufficiently fixing one of the biggest issues we had last season? With Erin Henderson as the only returning linebacker in the middle of the corps, he is likely the only option. Henderson struggled last season in his first action as a full-time starting linebacker. Primarily the issue took place in coverage of running backs in the flats. He single-handedly was destroyed in the playoff game vs. Green Bay, making Dujuan Harris look like an All-Pro. In 2012, Henderson recorded 112 tackles (72 solo), which was good for fourth on the team. These statistics were placed despite Henderson receiving action in just 60% of snaps. The vast majority of these snaps took place when the defense was in the base package. In a recent interview with 1500ESPN's Tom Pelissero, Henderson addressed the many question marks surrounding his game. "People can say I'm not a three-down 'backer," said Henderson. "They can say whatever they want to say. But it's right there in front of your face. The proof is in the pudding. And I'm only going to get better from here. I'm going into my third season, and I've never felt more confident about myself or about my game than I do right now." The coaching staff is looking for Henderson to play with an "angry" edge in replacement of linebacker Jasper Brinkley, who was lost in free agency to Arizona. "Coach told me all the time, 'Play angry. You're too nice sometimes. Play angry,'" Henderson told 1500ESPN.com by phone last Wednesday. This is frustrating to Henderson and is forcing him to work twice as hard to prove the critics he can be an every down linebacker in this league. Coach Frazier has been mum about whether Henderson will be the starting middle linebacker and has never committed to him being the starter week 1 in Detroit. With Audie Cole entering his second season, backup and experienced veteran Tyrone McKenzie, and recently drafted Michael Mauti all on the current roster, Henderson will have to prove he can handle the load. Many thought the Vikings would address the middle linebacker position by selecting Manti Te'o in the first round, but the Vikings passed on him three times. With other positions taking prevalence, the Vikings were unable to address the position until the 7th round of the NFL Draft. As discussed earlier, 7th round selection Michael Mauti could be an option, but will need to show progress after suffering his third ACL tear in college last season. 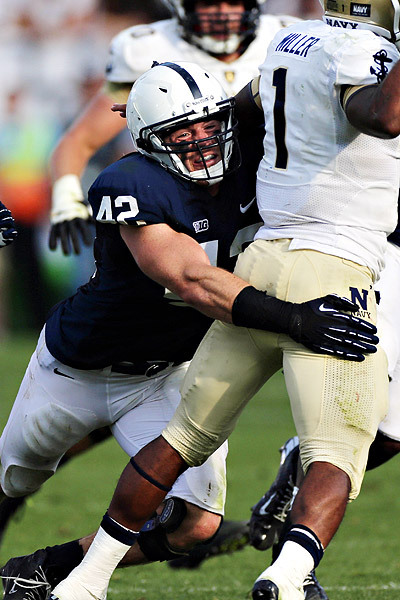 Many had Mauti valued as a second or third round selection, until he sustained the third knee tear at the start of the 2012 college football season. As the media became more unsettled with the Vikings middle linebacker situation, rumors began to surface last Thursday that the Vikings were very interested in Brian Urlacher. There is an amount of uncertainty that the Vikings want Urlacher, a five-time All-Pro with the Chicago Bears who is in obvious decline at age 34. In an interview with NFL Network, Frazier shot down the rumors "at this point." It leaves the doors open, but it certainly seems unlikely with a team that is looking to get much younger. Henderson is an option, but he will have to prove that he is willing to work hard in a new role of the defense. This will be one of the many storylines as training camp approaches and will be an area that Vikings fans will be watching closely. He also discussed disrespect and talked about his early days of being undrafted and receiving his first contract of $20,000. "They could have easily let me go," Henderson said. "They could have easily moved on to somebody else, brought somebody else in or done something. But for whatever reason, I'm still here. Evidently, I'm doing something right." "And to the fans who don't believe that I can do it, you haven't seen me do it. How can you say that I can't do something if you haven't seen me do it? They say different things about my abilities or whether I should be a starting linebacker or everything else, but my numbers and the fact that I'm still here speak for themselves," started Henderson. Only time will tell whether or not Henderson will evolve into an every down linebacker in the NFL, but he certainly is motivated and has the angry edge needed to accomplish the goal at hand.